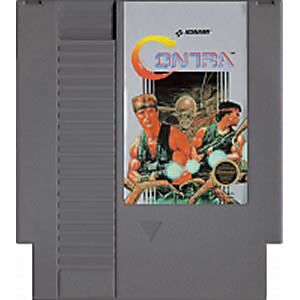 Contra original NES Nintendo Game cartridge only - Cleaned Tested and Guaranteed to Work! The universe teeters on the brink of total annihilation at the hands of the vile alien warmonger, Red Falcon. Earth's only hope rests with you, a courageous member of the Special Forces elite commando squad. Your mission: Battle deep into the deadly Amazon jungle, where the Red Falcon and his galactic henchmen have transformed ancient Mayan temples into awesome monuments dedicated to mass destruction. A multitude of weapons, from rapid-fire machine guns to high-tech lasers are at your disposal as you sweat blood, fighting past 3-D mazes, underground security systems, and tropical forests surrounded by giant waterfalls and alien cannons. This is the ultimate test for the ultimate guerilla warrior. And if you survive, Earth survives! Does anyone know anyone who beat this game honestly? I dont. The Dark Souls of its time, the difference being, i know someone who beat that game. 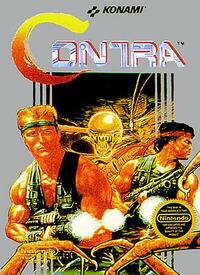 A must for any NES collection and even better when its free with lukie points. I remembered playing this game as a kid. Luke Games delivered on expectations. The game arrived on time. I did have to talk sweet to the cartridge and work the typical magic for abnintendo game, but when it finally played it was awesome. One of the best games ever. I will definitely buy from Lukie Games again. Great condition cart. How could you not have this in your collection. Very competitive prices and is shipped out in a short time! I'll be shopping to add to my collection from here again soon! I got this for my husband and he enjoyed it like a kid. worked great once I cleaned it. When wanting to revisit the nostalgic days of our youth, many aspects of leisure come to mind, but none other reaches a level of fun as our old NES systems. In comparison to modern gaming, which(mostly)lets you decide game difficulty, NES games gives you no choice in the matter. When playing old games, I find some are not to challenging(Super Mario Bros for example) to games that make you go gray with frustration due to near impossibility(Street Fighter 2010, Silver Surfer, to name a few), and how cryptic they can be(thankfully we have the internet now, not having to subscribe to Nintendo Power). 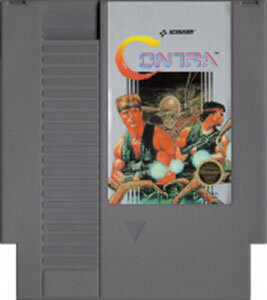 But a game like Contra is a nice blend of the best of both worlds: Not to cryptic with an acceptable level of difficulty(still grateful for the 30 lives code though), which to this day makes Contra one of the top NES games to revisit. This is probably one of the best games on the NES. If you do not have it, I recommend getting it. Brings back alot of memories from my childhood. This game is beloved and hard as hell, most gamers never beat the game (unless they use the Konami Code for 30 lives; up, up, down, down, left, right, left, right, B, A, Start) this game ranks high on many toughest NES games lists. This game was very popular at the time of release and many gamers still play it for the challenge. Without the Konami Code you are only get 3 lives and either way you go against 8 stages of livig hell. Think you're a Gamer, or THE GAMER? Then buy this S.O.B. and BEAT IT! Also if you've already beaten it, you're probably not done, because like many NES games, there's a second quest, actually it goes on, and on, and on, until you die, however this game is hard enough on the 1st quest, the game doesn't get harder after the tenth quest, however, if you think you're THE ULTIMATE GAMER beat Contra without the Konami Code and/or Game Genie on the 10TH QUEST and post it on YOUTUBE, I will forever remember you if you do. I will make sure every RETRO GAMER knows your name if you can do the above challenge while using the POWER GLOVE. I ****ING DARE YOU TO BUY THIS GAME AND BEAT IT, OR BETTER, BEAT MY CHALLENGE FROM ABOVE!!! Que dire sur Contra? Classique, amusant, une excuse pour réunir les copains avec de la bière, des chips et ailes de poulets. Avoir du plaisir comme dans le bon vieux temps. Personne n'a jamais refuser de jouer Contra avec moi dans mon sous-sol. Alors c'est tout dire sur ce jeu extraordinaire! Love this game! My brother and I were almost late for work playing, brings back memories. Thanks Lukie!